Cowley County Community College issued the following announcement on July 31. 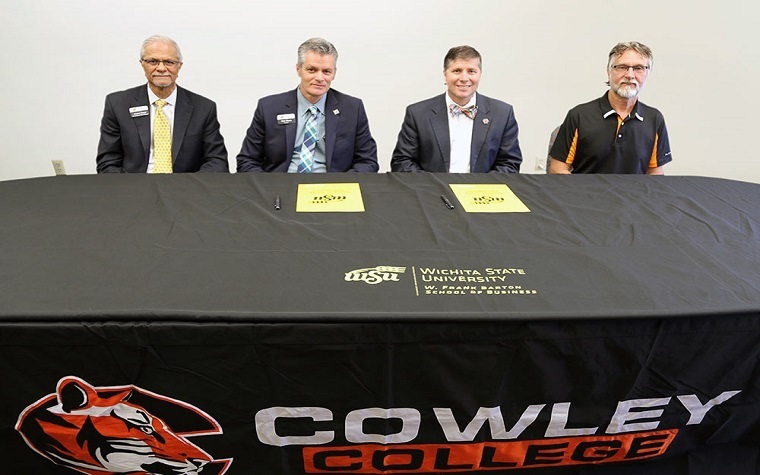 Having signed an articulation agreement in engineering with Wichita State University prior to the start of the 2017 fall semester, Cowley College and Wichita State partnered once again with the signing of a 2+2 agreement on Monday, July 30, 2018. The purpose of Monday’s 2+2 agreement is to provide Cowley College students a four-year coordinated program where students will receive an Associates of Arts degree at Cowley College in the first two years and a Bachelor of Business Administration from Wichita State University after two additional years. The agreement is for Cowley College students who have earned an Associates of Arts degree according to the degree plan, achieved a minimum cumulative GPA of 2.0, and applied for admission to WSU, to be guaranteed admission to WSU with completion of application requirements and receipt of transcripts. “This is a great way to encourage students that obtain an Associates of Arts degree at Cowley College to go on to a Bachelor of Business Administration degree from Wichita State University,” Anand Desai, Dean of the Wichita State University W. Frank Barton School of Business said. Students would enter WSU with junior status toward a baccalaureate degree and be guaranteed to transfer 60 credit hours from Cowley College to WSU. “All of our articulation agreements are intended to help students transfer seamlessly and avoid taking courses that will not count toward their graduation at Cowley or at their transfer institution,” Cowley College vice president of academic affairs Dr. Harold Arnett said. Rick Muma, provost for Wichita State University, echoed Dr. Arnett’s statements and said WSU’s goal is to make education as seamless as possible for the students. According to Cowley College president Dr. Dennis C. Rittle, this agreement will begin with the 2018-2019 academic year. Next time we write about Cowley County Community College, we'll email you a link to the story. You may edit your settings or unsubscribe at any time.